Industrial Way in the Mill Quarter above the Old Mill District has become a small haven for the hip. Originally situated with Crux Fermentation just up the way, sitting next to Spoken Moto (on the other side from the food cart pod), Head Over Wheels Hair Company (get it?) has moved one block and now sits on Arizona Ave. 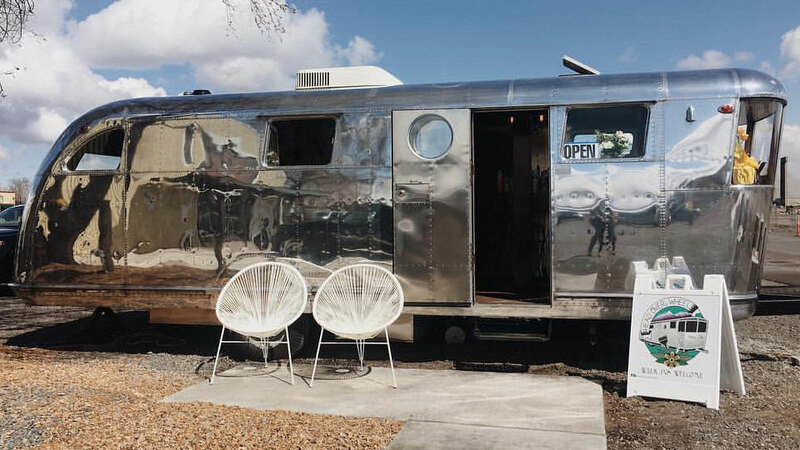 In the brightest, shiniest 1946 Spartan Manor travel trailer you’ve ever seen, they offer a full range of hair services for men and women, including cuts, color, styles and treatments. Launched in 2017, they’re open Tuesday-Saturday from 10:00 a.m. – close. Just try to walk or drive by without being tempted to peek inside; don’t worry, they’re used to visitors and people saying “this is so cool!” They get high marks in the review department from both men and women, with customers commenting on their on-trend styles, listening skills and product and technique recommendations.